With another academic year coming to a close, this week’s Throwback Thursday picture is of St. Mary’s Academy taken during the 1940s. Built between 1927 and 1929 at the south end of Academy Drive in south Windsor, to replace a school located on Park St. East (today the tunnel plaza) in downtown Windsor. Built in a Gothic style, with 5 floors, a chapel, classrooms and accommodations for students. 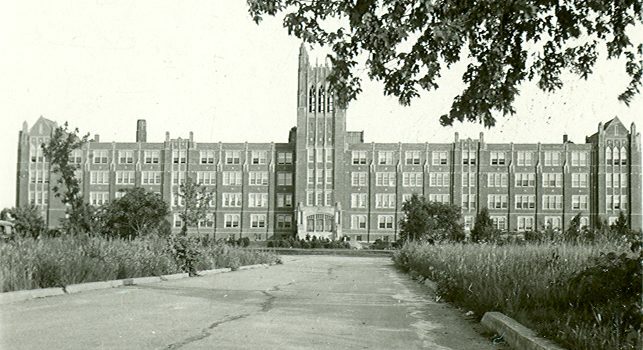 The school was closed in 1971, and after a number of attempts to save the building it was demolished in 1977 to make way for single family residential housing. If you would like to look at other historic pictures of Windsor, please visit the library’s digital exhibit “Windsor’s History and Pictures” at http://heritage.windsorpubliclibrary.com/index.php.